Is Life a Revolving Door? I know many of us as pastors’ wives understand what it is like to live life feeling like it is a revolving door. Life just gets so hectic we can’t keep up. Do you ever feel like you live in a revolving door? You know, just when you think life will slow down and pause long enough for you to hop off and take a breath, it just spins on and on and on!! Demands, obligations, others’ needs, a to-do list that never gets shorter, and surprise situations that come up can keep you feeling like you’re going round and round and getting nowhere fast! That revolving door doesn’t feel like a way to get from one place to another, it feels more like a trap — a place where you have no control over where you’re going and when you’ll get there. Does your life feel that way sometimes? Does it feel that way now? Oh girl, mine does! I just finished up my last speaking engagement for the spring season and I thought that when my traveling was done and summer came, so would a chance to breathe! But, not yet sister!! I feel like I’m in that revolving door of demands and the momentum is pushing me and pulling me until I feel powerless to manage my own life! Let me be clear though, I am no victim of my schedule and I am not ungrateful for my life — no stinkin’ way! But I am running out of breath and need to get a handle on what I’m doing and when I’m doing it and why I’m doing it. Can I get a witness out there?! It’s time to break the cycle… get a grip on our lives and hop out of that revolving door so we can take a breath! If you’re stuck in a pattern that pushes you from one thing to the next; if your life feels like you are stuck in a revolving door… we are about to bust out! Here’s what I’m trying to do to break out of this crazy cycle: I imagined what would happen if I really was stuck in a revolving door — you know, like in the airport or a department store. What would I do? Would I stomp my feet in anger or pout or claw the glass or try to run faster within the spinning? No… here are the things I would do in a real revolving door, and they work in real life too! I don’t know about you, but when I feel out of control or under a lot of pressure, I can easily get all worked up and panic. But, panicking while you’re spinning around in a revolving door won’t help you at all, will it? When we feel stuck in a situation and can’t seem to figure out how it will ever end or change, we first must be calm. Panic never increases our ability to think clearly. Panic triggers emotional thinking. When we think with our feelings, we let worry or fear guide us into further despair rather than allowing wisdom to lead us out of our confusion. No matter what you’re stuck in right now, take a deep breath, slow down your emotions, and look to the Lord. Ask Him to replace your panic with His peace. If I was really in a revolving door, I would keep walking, right? Well, sisters, we just gotta keep walking! You can’t make progress if you don’t progress. Just keep taking steps forward. Stomping your feet in anger or despair or going backwards aren’t options in a revolving door and they aren’t options in life either. So, keep walking; focus on the next wise thing you can do and eventually you’ll find that opening you’ve been waiting for just around the bend. Pick out one practical step you can take — say no to one thing, create one boundary, take one day off… you get the idea. If you aim at nothing you will certainly hit it so take another step toward where you want to go and the person you want to be. Sometimes you just have to push forward when you’re in a revolving door so you can get out faster. Well, sometimes you have to apply a little muscle to your situation so you can get out of it. You have to apply a bit of spiritual strength, perseverance, and tenacity. Few things change overnight; we’ve gotta have patience within the circumstances we find ourselves in, whether we’ve created them or not! God will show us when it’s time to push through or push back. We can trust God to help us push in prayer, push with discipline, and push until we’re free! I’m trying to apply God’s wisdom to show me how to step out of my revolving door and avoid willingly stepping back in! In other words, we can learn to control what we can to avoid being mindlessly pushed and pulled by our lives and schedules. Just because we’ve done life a certain way in the past, doesn’t mean we’ve got to do it exactly the same now. You can step out and change what you can. If life happens to you in such a way that you find yourself spinning about, dazed in a trial you never expected, then just start walking wisely through it. 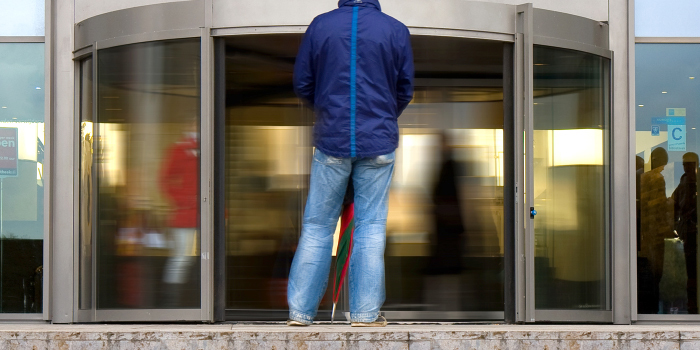 Now, if the revolving door you’re dealing with is one you actually walked into willingly – though accidentally – learn from it and avoid it in the future. Girl, that’s what I’m trying to do! So, if you’re spinning about, guess what you just did when you read this blog? You slowed down, caught your breath and in this moment of calm, you can ask God to give you what you need for where you are right now. Thank You, Lord! I want to encourage you to break out of your crazy cycle and implement the four steps Jennifer shared with us today. We are here to come alongside you in any way we can on your journey. Photo courtesy Flickr user Marcel Oosterwijk via the Creative Commons license.